This variant is simular to Ayoaya and much played in Kenya and Ethiopia. In the first round, players must try to capture the most stones. In the second and succeeding rounds, the aim is to reduce the opponent to 4 or fewer stones. The game requires more stones than other variations as you start with 6 stones in each small bowl. It's alowed to drop stones in either direction. In order to take a turn, a player must start from a bowl with more than one stone, else he must skip the turn. When the last stone is dropped in a bowl with other stones, the player takes all those stones and drops them in the opposite direction. This goes on until the last stone is dropped into an empty bowl and this will end the turn. 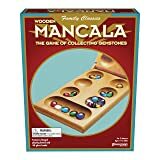 When this empty bowl is on the opponent's side, nothing happens but else the player puts that stone and the stones in the opposite bowl in his Mancala. However, player can only grab the stokes from the opposite bowl when no stones were added during that turn. 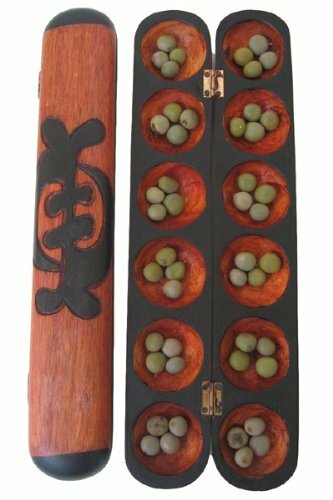 If there is an empty bowl next to the bowl of the last dropped stone, the player may also take the stones from the opposite bowl and this process repeats until you reach a bowl with stones on your side or an empty bowl on the opponent's side. Multiple rounds of the game are played until one player has four stones or fewer left. The game is also over when both players can't play any stone. At the end of the game, the players keep the stones remaining in their own bowls.